The Kurdish people are a nation who for centuries have existed without a recognised state and who live in regions of Iraq, Syria, Iran and Turkey. In their resistance against repression in Turkey they formed the PKK, which initially was a Stalinist-based guerilla movement. But then, the story goes, their imprisoned leader, Abdullah Öcalan, happened upon some books by the celebrated American anarchist, Murray Bookchin, and apparently changed his political views. 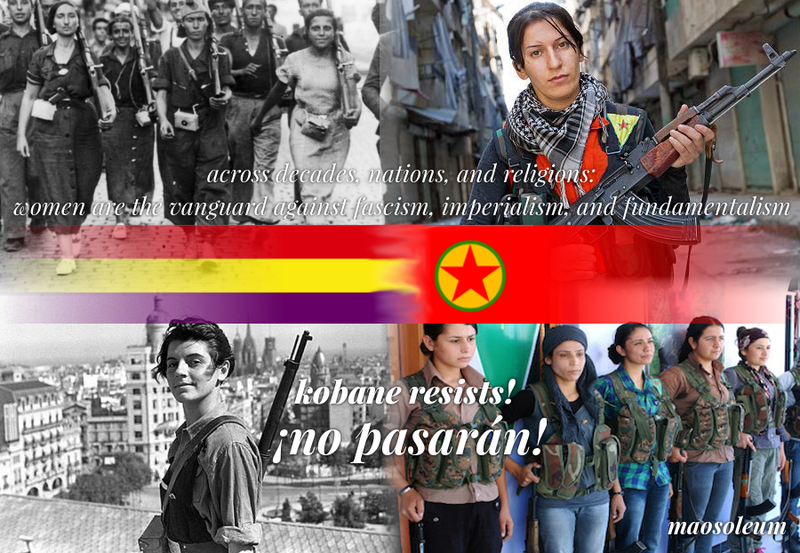 It wasn’t long afterwards that in parts of Kurdish-controlled northern Iraq the guerilla movement there – known as the Movement of the Democratic Society (Tev-Dem) – began to organise differently – in an anarchist way, stressing lack of hierarchy, equality of gender and social revolution. And when Syria collapsed into civil war, the northern Kurdish area of Rojava started to collectivise industry and services in a way probably not seen since the successful, though short-lived, Spanish Revolution in 1936. The siege of Kobani, which began towards the latter part of last year, formed one of the main battlegrounds between the Kurds and ISIS. But a couple of weeks back, after months of bombings and fighting on the ground, the city – or what was left of it – was finally relieved – mostly by women in the YPG and of the Rojava revolution. After the relief of Kobani, Social Rebellion, an anarchist group based in Istanbul, issued a statement of solidarity with the Rojava revolutionaries, then crossed the border to support the liberators of the city in its reconstruction stage. Social Rebellion have also been joined in their endeavour by the United Liberation Forces “Birleşik Özgürlük Güçleri” (BOG), together with green anarchists, ecologists and communists from a number of countries and who declared their support for the Rojava revolutionaries. Another Turkish-based anarchist organisation, Devrimci Anarsist Faaliyet, or Revolutionary Anarchist Action, is also providing direct support. “Many people from the rank and file and from different backgrounds, including Kurdish, Arab, Muslim, Christian, Assyrian and Yazidis, have been involved. The first task was to establish a variety of groups, committees and communes on the streets in neighbourhoods, villages, counties and small and big towns everywhere. The role of these groups was to become involved in all the issues facing society. Groups were set up to look at a number of issues including: women’s, economic, environmental, education and health and care issues, support and solidarity, centres for trade and business, diplomatic relations with foreign countries and many more. There are even groups established to reconcile disputes among different people or factions to try to avoid these disputes going to court unless these groups are incapable of resolving them. These groups usually have their own meeting every week to talk about the problems people face where they live. They have their own representative in the main group in the villages or towns called the ‘House of the People’. But there have also been moves in Rojava towards adopting a more Western-style democracy: a parliament has been set up, to which free elections under international supervision are to take place. This parliament – which consists of a minimum 40% of women – will apparently act in parallel to the ‘workers councils’. 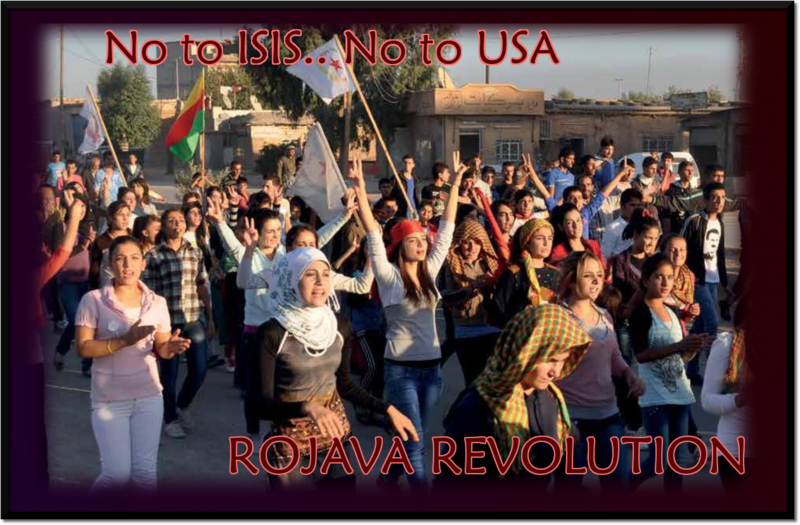 This entry was posted in Resistance, War and tagged anarchism, Iraq, ISIS, Rojava, Syria, Turkey, Yazidis. Bookmark the permalink.